The name might scare you, but don’t let it. There is nothing frightening here, especially if you want a grown-up place to get a good drink and hang out. Strictly speaking, Death and Company is not a speakeasy since it isn’t hidden from view, it’s location is public, and it even has a guy out front manning the door even on a weeknight. It also has some magnificent drinks, a vibe that feels contemporary without being hipster, and a staff that is refreshingly cordial and friendly. I like to think of it as Milk & Honey without the mystery or, alternately, Milk & Honey gone to grad school. 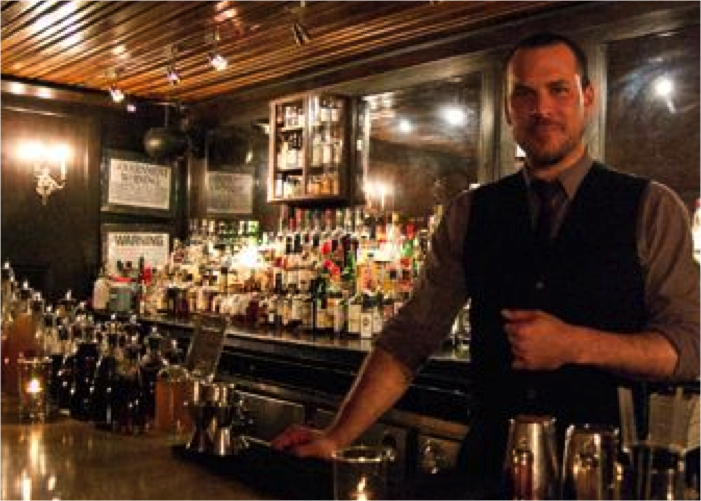 Unlike many other similar New York establishments, Death & Co. does not take reservations. It is strictly first come, first serve; if it is full when you arrive, they take your cell # and call you when there is a table. Jason Littrell, bartender extraordinaire and invariably the guy mixing my drinks when I’ve been there, told me once that they like to treat everyone the same, and that even friends have to wait their turn. I’ve never seen anything to contradict that. Fortunately for all of us, any wait you may have to endure is well worth it. All the drinks I’ve ever had at Death & Co. are impeccably composed, smooth drinking, and incredibly tasty. Their drink menu is wide-ranging and inventive (a slightly older version is HERE). It includes a food menu that is quite good — perhaps the best of any “mixology” lounge that isn’t attached to a full-blown restaurant. If you want to go off-menu for your libation, they certainly can and will accomodate. I once saw and heard a patron sitting out the bar call out a drink recipe with a rapid-fire cadence full of cryptic words that made it almost sound like he was a quarterback calling out an audible at the line. Mr. Littrell listened intently and then mixed up the drink order without flinching or asking for the instructions again. I’ve had quite a few drinks from their menu, some because they sounded good to me and others because they were recommended by Mr. Littrell. All I would happily drink again. I particularly enjoyed the “Grass Kilt:” a riff on a “Grass Skirt” with the gin replaced with green-tea-infused scotch, not to mention a few other nice modifications. Add all the ingredients to a mixing glass and fill with ice. Stir, and strain into a cocktail or coupe glass. Garnish with an orange peel. I need to have it again soon. The ingredients and preparation aren’t so difficult as to preclude any decent bartender from making it — or perhaps even making it at home. . . . Hmmm, I see a new holiday tradition starting up. Tags: Death and Company, Grass Kilt, Jason Littrell, Orkney Chapel. Bookmark the permalink.